Invited to arrive Friday morning and to sew as much of Friday afternoon and Saturday as you can. 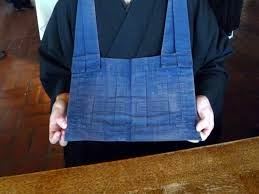 Come learn the stitch and help with the shuso's rakusu, making envelopes and other Zen sewing projects. Welcome to arrive Friday 1pm or Saturday 9am and come for as much as you can. (Friday morning is for jukai students only). Join sangha sewing teacher Shudo Chris Burkhart in sewing Zen ritual clothing. Those preparing for jukai are invited to arrive on Friday at 9am. Those who want to help with the shuso's rakusu and other sangha sewing are welcome to arrive on Friday afternoon or Saturday. Saturday 9am - 4pm Sewing continues for jukai students and others. Please RVSP so we know how many places to set up. Questions? Please contact Chris at chrisburkhart@hotmail.com.